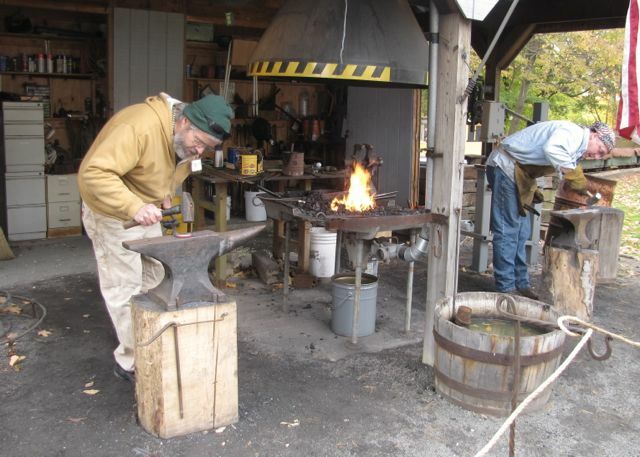 As WRABA is based at Century Village in Burton, Ohio, the club demonstrates blacksmithing techniques in the working forge at the following events hosted there. Member donated works are available for purchase at each event to help fund the club and maintain the facilities at Century Village. Many events feature a raffle of selected items. If you are a WRABA member, consider volunteering to work in the booth, sell raffle ticktes, or do a demo. If you cannot attend, consider donating items for the raffle. Popular items include candle holders, fireplace tools, hooks, letter openers, etc. Century Village is the home of WRABA and we encourage attendance at all their events, not just the ones at which WRABA demonstrates. Their success is our success, and vice versa. Exhibition and demonstratin of steam and other power-driven machines that led our Industrial and Agricultural Revolution. Day long festival celebrating bluegrass and fold music performed by a variety of musicians. Join us as we continue the tradition of making fresh apple butter in copper kettles right before your eyes.